Cross-Country Corvette: Cross Country Corvette Stage 7: 200 kms to home! Surprisingly well-rested, we left the hotel in Deep River early for the final stretch homebound. On the road by 7:00 our route took us southeast alongside the Ottawa River, We passed Chalk River, noted for its nuclear research facility, then Petawawa, a major facility for the Canadian Armed Forces. then Cobden before pulling off the road in Renfrew for breakfast at a Tim Horton's, staffed by what appeared to be the world's most cheerful retirees. But then again we had a very nice breakfast, considering it really is a fast food coffee shop. The place was bustling and we realized that the holiday feeling we had had for the last week was about to end; it was a normal Wednesday workday. 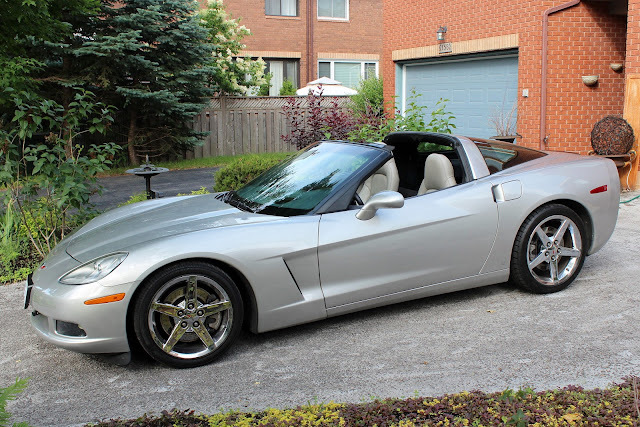 Soon we were on the 417 and entering Ottawa in morning rush hour traffic and first the first time I had to manage the Corvette in stop-and-go conditions as we passed through the extensive construction work happening on the Queensway. The car felt a little balky but the shifts were pretty smooth most of the time. And by 10:00 we were home. The next day the car went in for a safety check. This provided the not unexpected news that the rear tires needed replacement but I was not prepared to hear that the brakes needed to be redone as well. The dealer had said the front tires were pretty new but the rear ones would be good for one season and given that we had driven in one week what previous owners had put on annually, that was okay. But the brakes should have been fine but our mechanic said otherwise. The drilled brake discs of the Z51 performance package cannot be turned due to the ventilation holes but to its credit Stetson Motors in Drayton Valley stood behind its Certified Pre-Owned coverage and immediately refunded the cost of the brake work. I can only imagine that the prior owner(s) had perhaps tracked the car from time to time, which uses up brakes far more quickly than my more sedate driving ever would. Next up was a smog test, which the car passed easily, and then I went to the local Service Ontario office to get the car registered. This caused a great deal of confusion as nobody knew what to do as I did not have a provincial ownership document but after some discussion it was confirmed that the Bill of Sale from Alberta was indeed sufficient. But then when the VIN was run through the computer it turned out that Stetson Motors did not actually own the car! But a phone call cleared that up; in Alberta the dealers simply retain the prior registration while in possession but faxing their own Bill of Sale to the Service Ontario office showed the completed links in the chain of title so the registration was completed. The Service Ontario ladies were very helpful and apologized for the trouble but since the office is within walking distance of the house, two trips were not that big a deal and I wanted to be sure that everything was legal for the most expensive car I will probably ever buy. Now we truly were owners of our cross-country Corvette and more adventures on the open road were calling.